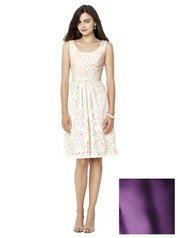 Cocktail length sleeveless dress has heirloom lace in white or black over colored lining. Grosgrain belt matches lace. Pleated skirt has side seam pockets.